PH series filters provide medium to high efficiency performance and extended service life. FOUR EFFICIENCIES are available: 45%, 65%, 85% and 95%. While the PH is a replaceable filter, its completely rigid construction assures structural and performance integrity throughout its entire service life. PH filters are ideally suited for variable volume systems. Being totally rigid in construction, performance is not affected by normal changes in heating, ventilating and air conditioning air velocities, or fan shutdown, and the filter’s configuration is not altered by accumulation of dirt. All PH filters may be operated at velocities up to 500 fpm. 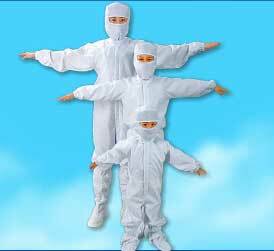 Underwriters’ Laboratories rating is Class 2. 52-76 Test Standard at 40~45% efficiency. The arrestance rating on that Standard is 96%. 52-76 Test Standard at 60~65% efficiency. The arrestance rating on that Standard is 97%. 52-76 Test Standard at 80~85% efficiency. The arrestance rating on that Standard is 98%. 52-76 Test Standard at 90~95% efficiency. The arrestance rating on that Standard is 99%. The PH series may operate at lower velocities to effect reduction in energy consumption. Graphs are available from Farr company indicating relative service life and pressure drop vs. airflow. 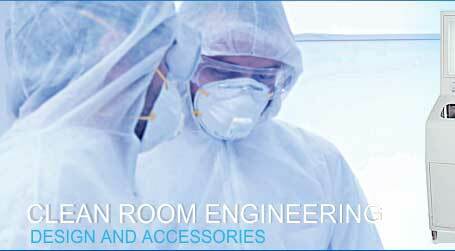 Filters are individually tested for efficiency using 0.3 micron Dioctylphthalate smoke. 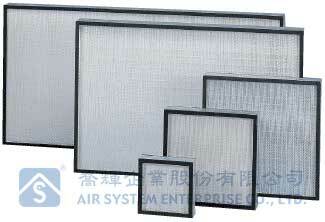 The results are indicated on each filter along with air flow and pressure drop. 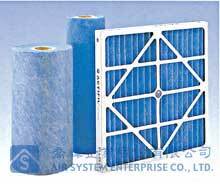 Filters are tested for air flow resistance and DOP (dioctylphthalate) smoke penetration (a mean particle diameter of 0.3 microns) by measuring upstream and downstream concentrations of the smoke by photometer. Each filter is individually tested and certified. Woodboard, metal or plastic as specified. Highly efficient microfiberglass paper folded over corrugated separators of aluminum which prevent the media from nesting and channel air flow for lowest possible resistance. 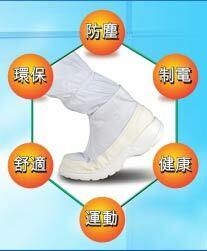 Sponge neoprene or other specified materials. A continuous sheet of Micro Glass Fiber Paper is pleated into closely spaced pleats, each pleat supported by a corrugated separator. 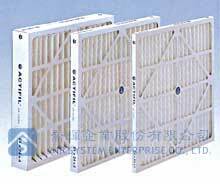 The filter pack is enclosed in a frame of wood board or metal. Plastic can be specified for special construction. The filter is sealed into the frame using a Fire retardant adhesive.